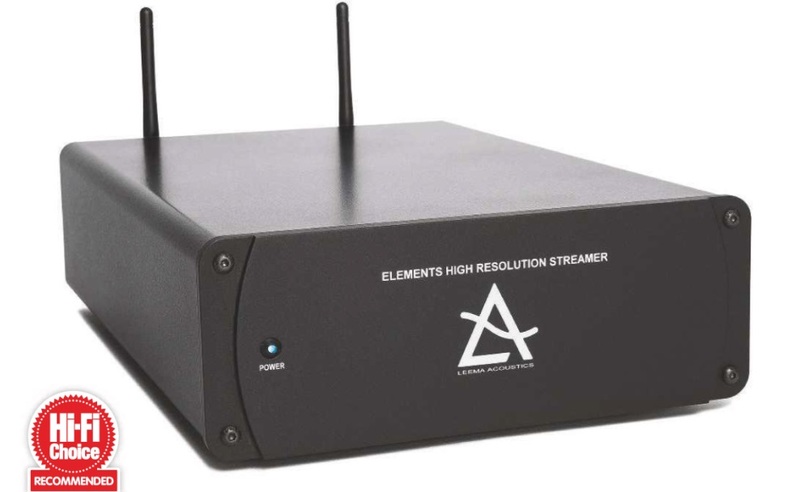 s part of Leema Acoustics’ comprehensive Elements range, the Streamer is its most affordable network player to date and borrows the streaming platform from its Stellar series Quasar integrated amplifier (HFC 425). 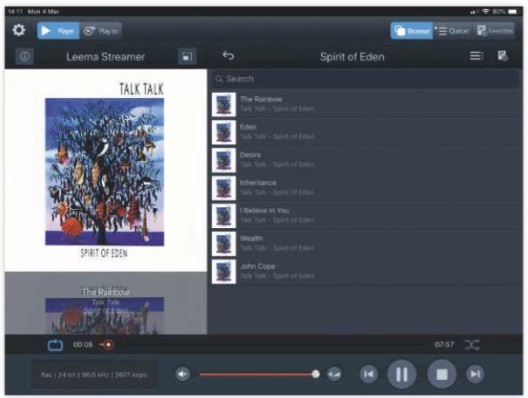 The software can act as both client and server, so content attached to it can be made available elsewhere with compatibility for up to 24-bit/192kHz PCM and DSD128 music files and streaming service support for Tidal, Qobuz, Deezer and Spotify Connect as well as internet radio services via vTuner. Decoding is taken care of via an ESS Sabre DAC, in this case an ES9018 – rather than the bespoke Quattro FPGA-type found in some of its more expensive products – and the decoded signal is made available to a choice of balanced and unbalanced analogue outputs as well as optical and coaxial digital connections. 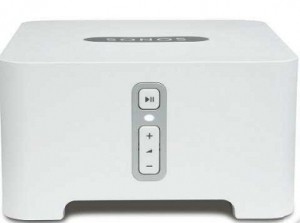 There are no digital inputs, AirPlay or Bluetooth wireless connectivity, and compared with rivals the Elements Streamer can feel a little parsimonious. This sense of sparseness is increased by its operation being app dependent. There’s no front panel display or physical buttons anywhere, making it completely reliant on the control app on a tablet or smartphone to navigate its functionality. As with other Leema Acoustics components we’ve seen, it uses third-party mConnect software but results can be a mixed bag. Going to Apple’s App Store or Google Play reveals multiple options, which can be a little confusing, but ‘mcontrolHD’ is found to be the optimal version with my Android devices and proves to be fast and stable in use. It does have some quirks, however. There is no alphabetic quick access on the album list, which results in a lot of scrolling through my music library. The playback process is also different for material accessed from connected NAS drives and streaming services, and requires you to select ‘Play all’ for it to play an album. One very useful feature is a lock screen control that means you can pause playback without having to unlock the device that’s running the app. With no controls or screen, the front panel looks a little nondescript, but the half-width unit feels nicely constructed. Rear panel connections are solid and well laid out, and setup is straightforward using the WPS button to pair it automatically with wireless home network routers. There’s also a wired Ethernet connection. Running into a Naim Supernait 2 integrated amplifier connected to Neat Acoustics’ Momentum 4 speaker and accessing music from a Melco N1A NAS drive (HFC 397), the sound immediately impresses. The slightly ‘etched’ presentation I have found with some ESS DAC-equipped components is entirely absent, and the Elements Streamer manages to offer a deeply appealing balance of warmth and refinement that doesn’t affect its ability to handle more up-tempo material. The result is a device that can handle less than stellar recordings with real sympathy. Manic Street Preachers’ Resistance Is Futile can come across as thin and edgy, but here it is almost luxuriant. James Dean Bradfield’s soaring vocal in opening track People Give In is rich and nicely controlled as the Leema locks the vocal centre stage and opens the performance out around him, extending out beyond the confines of the speakers. even when played at antisocial levels. It is supremely refined rather than dull and doesn’t harden up or prove fatiguing to listen to at higher volume levels, meaning it will happily slot into a wide range of systems without upsetting the balance. Bass handling is outstanding and the struck drum in Fink’s Sort Of Revolution has almost seismic impact. There is a nuance and texture with perceivable decay to it that aids the feeling of realism. It never struggles to find fine detail, but rather than highlighting everything it’s expressed as part of the wider flow of the music so that live material in particular sounds great. ZZ Top’s frenetic Backdoor Medley is a treat that sees the audience becoming a participant in the piece rather than abstract noise in the background. Across a very wide selection of material, the Leema is consistently fun to listen to and never fails to engage. It has an excellent grasp of timing and performs the neat trick of letting the relentiess savagery of Orbital’s The Raid take centre stage, but it can then deliver Nils Frahm’s Wintermusik without the slightest sense of it being forced. There is also precious little difference in the performance via streaming services and the same material played from my Melco NAS drive. Its fundamentally benign presentation means that even compressed services are still entirely listenable while internet radio also works well provided that you stick with the higher bit-rate stations. Similarities with Naim’s ND5 XS 2 (MFC 446) are hard to ignore. Both are dependent on apps to function, but the Naim app is outstandingly good and AirPlay, Bluetooth, Chromecast and digital inputs are on offer. The Elements Streamer has better streaming service support and crucially costs around less. Sonically, it’s hard to make a definitive call with both putting in strong performances, however the price difference makes the Elements Streamer a better value option.